THE NATURAL HAVEN: Reader Questions - Coconut Oil Before Washing? Reader Questions - Coconut Oil Before Washing? Coconut oil appears to be the flavour of the day and specifically coconut oil's role in hygral fatigue (Damage due to swelling and contraction of hair due to uptake and loss of water). I think Myss's email sums up quite a few questions that have popped up. I am suggesting that coconut oil should be applied first before the water. I think science is catching up to what women have done for years. In India, it is quite typical to apply coconut oil to the hair before washing it. It seems a strange concept to apply oil before wetting, but it is not so strange after all. Science has now shown that this practice could be beneficial. The article I cited in my original article (Journal of Cosmetic Science pg 169-184,2001) is based on applying coconut oil to the hair strands and leaving it overnight. The hair is then washed with an SLS solution and studied. The scientists observe that the coconut oil does penetrate through the strand of hair while mineral oil doesn't. This means that coconut oil could contribute to moisturising the hair. The second observation is that when the hair is wetted, the coconut oil does prevent it taking up water and therefore stops the strand from swelling. The difference between untreated hair and coconut oil is 48%! 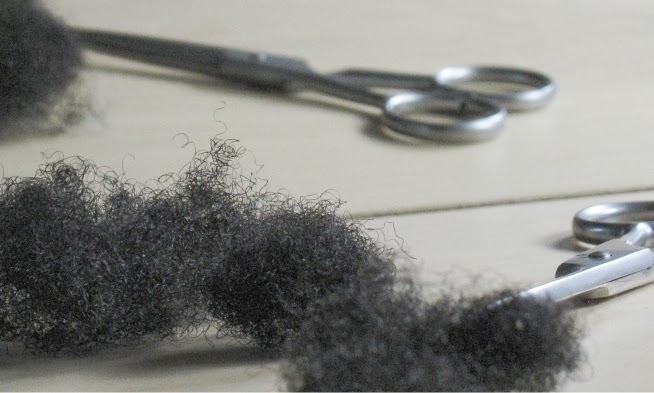 Remember that swelling the hair shaft can damage the hair cuticle and cortex which can weaken hair. So yes oil does repel water but this is not always a bad thing (atleast for coconut oil)! Keep in mind that coconut oil does moisturise itself and it can be used as an oil film after washing to 'seal in moisture. I would encourage you to read my previous article on sealing moisture. I think the concept of sealing in moisture is a little bit exaggerated at times. How much do you love coconut oil? How do you use it? Thanks... a friend and I were JUST talking about this! Thanks for clarifying things girlie! My hair is always dry except at the nape of the neck. I try to wash my hair every other day because it is always so dry. But the day after I wash my hair my hair is oily at the nape. I also have oily skin on my face and upper back and my scalp is oily. However my the rest of my hair and especially the front, which is the curliest is always dry. Should I only be washing my hair at the roots twice a week? I worry that my hair won't look and smell good with all the product I have to use if I only wash it twice a week. Plus, my scalp is so oily in the back. I would love to try the coconut oil trick but I worry about my hair being oily at the roots. Should I only apply it to the ends? Help! Oh my goodness. this is awesome! I'm going to try it tomorrow morning. well tonight for the coconut oil and tomorrow morning for the wash. I don't really like the smell of coconut oil but I love the benefits so this way I can get the benefits without keeping the smell. Yes! Thank you so much. I absolutely love your blog. I appreciate so much that you provide actual science behind what you advise. It makes it so much easier to weigh whether or not to incorporate something into my regimen. Thanks again! Tonight I was playing around with my homemade whipped shea butter w/ coconut oil and applied some to my face before washing and then again afterwards. Usually I just apply it after washing. I guess I'll do this for a week and see if I notice anything different. As for my hair, I use a spray bottle w/ distilled water and dampen my hair then apply the whipped shea butter w/ oil. Last month I used whipped shea w/ organic extra virgin olive oil, but this month I'm using organic coconut oil. I do this water/shea moisturizing routine in the morning and at night. So the last thing on my hair at night is the shea butter/coconut oil. The first thing on it in the morning is water. I have noticed some of the water sort of balls up or simply rolls off. My hair is soft and moisturized though and based on what the article said, I guess it's being protected from too much swelling at the cuticle - sounds good! Olive oil has not been studied to the same extent as coconut oil but it was suggested in atleast one paper that it has similar oils to coconut oil and could penetrate the hair strand. Olive oil gets the thumbs up therefore. Perhaps THIS is why Loo made pre-poo w/ coconut oil a requirement. I may actually give this a try since I'll be out of my AO HSR next wash! Thanks for always bringing the info Jc! I know this is a supperrrrrrrr old post but I NEEEED to know. Can i still get the benefits of prewash coconut oil if i soak my hair in it after I spray it with alittle water (80 to 90 percent dry)? I find that this makes my hair EXTREMEly soft and most of the oil is absorbed not dry at all but not too soft to break. I find the coconut oil on 100 percent dry hair for me absorbs by the morning and its smooth but it just doesnt make my hair as soft and easy to comb and it can feel very strong and dry compared to when I spray it with alittle water but i reallllly dont want to get hydral fatigue as a have thick strand, dense 3a-3c hair and i never do anything but wash and gos on my hair. I see youtube guru Farah Dhukai spray her hair alittle when she does her treatments with almond oil and look at her hair ( also is there anything scientifically special about almond oil besides what you listed on your almond oil post? )and another question is it bad that i co wash daily with the hello hydration? i have under 6 inches of hair and a very loose curl. I dont have a problem with the silicones as i use the Evercreme shampoo once a week.